Celebrate School Spirit with eBook from FaveCrafts! It’s back to school time! Time for football games, pep rallys, homecoming celebrations and parades…and what better way to show off your school spirit than by creating your own unique tie dye shirt, made with your school’s colors! With the help of How to Make Tie Dye Shirts, Décor and More: 18 Tie Dye Patterns, the newest eBook from ilovetocreate.com and Favecrafts.com, you can create all kinds of shirts to help you show off your school pride. Download How to Make Tie Dye Shirts, Décor, and More: 18 Tie Dye Patterns today! This Cobbled Bicolor Tie Dye Tee is a great way to show off your school colors. Tie dye projects like this are even better when you do them in groups, so gather your friends, teammates, and coaches together for a tie dye party! Everyone will love getting in on the fun of creating their own unique shirt. You can find this pattern and several more tee shirt patterns in How to Make Tie Dye Shirts, Décor and More. Best of all, this eBook is FREE to download! You can save it to your computer, iPad, or laptop and have it available any time you need it. You can even print it out and have all the patterns ready for your tie dye party. Celebrate homecoming in style this year with the help of How to Make Tie Dye Shirts, Décor and More! 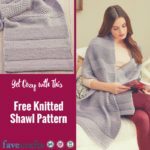 Hi there, FaveCrafts readers! 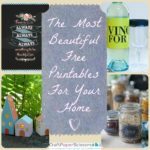 I’m Suzannah from Adventures in Dressmaking, and in celebration of the publication of How to Make Tie Dye Shirts, Decor, and More I thought I’d share with you a few of my fave tie dye project ideas. I’m sure you’ve been inspired already this month from tie dye posts, but some of these are pretty original, so I know you’ll see something new! 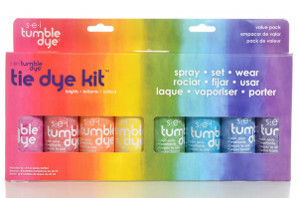 If you’re up for clothing, home dec, or other tie dye projects, check out these!! Which ones are your faves??! No tying involved exactly, but you’ll need bottled dye–how about making your own yarn colors, with this tutorial? I love the soft, natural mottled look you get when you knit with it! I love how simple and cool this dip dying project is–a dip-dyed lampshade is so modern and natural-looking! 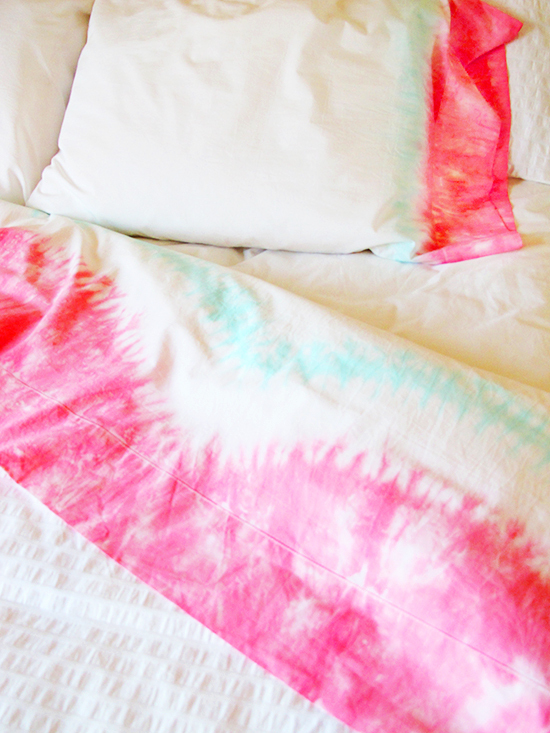 I love bedrooms, bedding, and bedroom decor… and these tie dye sheets are the coolest I’ve ever seen. They are SO fun for summer! Like something you’d see at a really trendy shop… but you can make them yourself in whatever colors you want. Perfect! If you’re feeling really adventurous, how about trying some wax batiking with your tie dye? You could get really creative–like with a gingham print and tie dyeing! A really great intro about basic tie-dying techniques. 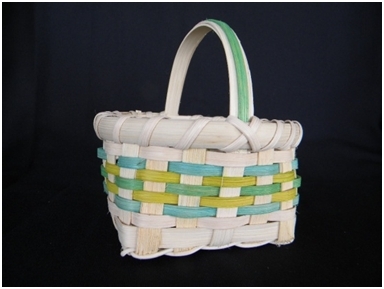 I love seeing the “before”s with the rubber bands on–reminds me of tie-dying experiments when I was a kid; I never understood how my mom made such cool shapes on hers when we took the rubber bands off! Along with learning the basics, how about learning a pattern, like on this asymmetrical stripe tie dye tutorial? It’s so helpful to see the folding patterns! And here’s a tutorial and video on how to make a tie dye heart pattern–perfect for these little girls’ dresses! If you’re gonna go tie dye, why not go all out, eh? 😉 For the very bold, these tie dye leggings have a designer vibe, perfect for late summer! Colored pants are way more fun than plain, anyway! If you’re not quite up for the pants, here’s a tried-and-tested tutorial for tie dye tights. Way fun! Tie-dying a tote?? What a great idea! What a fun summer bag! For a simple and chic tie-dyed tote, try this fun canvas grocery bag project! So, they’re not really tie dye, but in the spirit of things… how amazing are these watercolor cookies? What a great snack for a tie-dying party!! And once you master these basic tie dye projects, try some of the dying ideas from Contemporary Dyecraft. Such a beautiful book! So there you go, readers! Hope I’ve inspired you to get out there and try your Tulip dye kits. My most recent dying projects were these shoes and dip-dyed tee and these jeans. And I’m hooked! 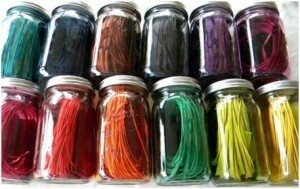 Love dying things to the color I want, and am dreaming of dip-dyed or tie-dyed curtains. 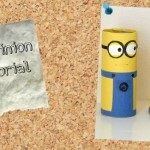 So feel free to stop by my blog sometime and check out my other recent projects! And if you want more tie dying project ideas, you can download this free book full of tie dye projects from I Love To Create. 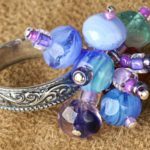 Filled with tons of unique tie dye project ideas, you will love all the step-by-step instructions and full color photos. 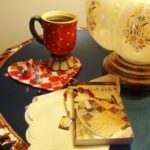 Don’t miss out on all the fun with this free book. Tie Dye is not just for T-shirts anymore. Make the magic of summer last all year long with these awesome tie dye patterns! FaveCrafts has teamed up with ilovetocreate.com to bring you How to Make Tie Dye Shirts, Decor, and More: 18 Tie Dye Patterns, filled with tons of easy tie dye projects that you can wear, accessorize with, and use to decorate your house. Perfect for kids birthday parties, crafting parties, and back to school nights, tie dye is a budget friendly and easy craft do to with a bunch of your friends and family. Have everyone bring a white tee shirt, pillow case, or apron and gather together to create fun and unique projects that everyone is sure to love! I know when I think of tie dye, the first thing that comes to mind is tee shirts. I remember making tie dye shirts with my friends for Back to School Night. It was so much fun to create these colorful tee’s, and even better when we got to show our work off to everyone at school! Since tie dyeing tee shirts remains one of the most popular ways to tie dye, we were sure to include plenty of awesome tutorials and techniques in How to Make Tie Dye Shirts, Decor, and More. 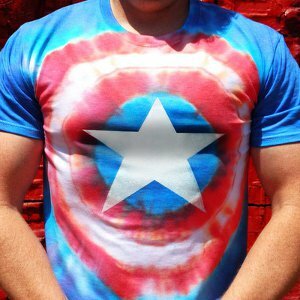 This Captain America Tee Shirt is perfect for all the super hero fans out there…and it can also double as a patriotic tee to wear for the 4th of July! 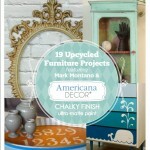 There are also several tie dye techniques that are perfect for creating beautiful home decor for any room in the house. 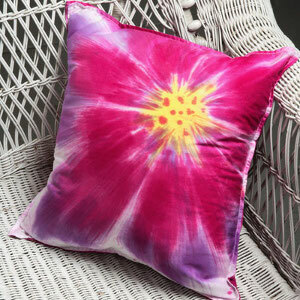 This Sunburst Blossom Pillow looks like it was painted onto the pillowcase, but you can create this look with ease using a very simple and basic tie dye technique. 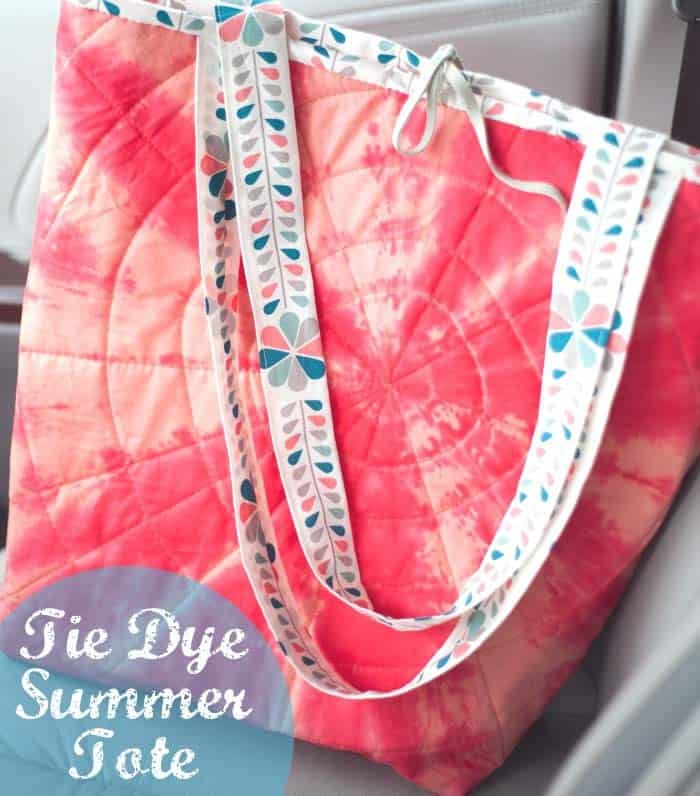 You can find this pattern, as well as many more pillows, totes, aprons, towels and more in How to Make Tie Dye Shirts, Decor, and More: 18 Tie Dye Patterns! If you’re looking for a different look other than the traditional tie dye swirl, be sure to download How to Make Tie Dye Shirts, Decor, and More: 18 Tie Dye Patterns today for some awesome projects that show off patterns that look anything but tie dyed! 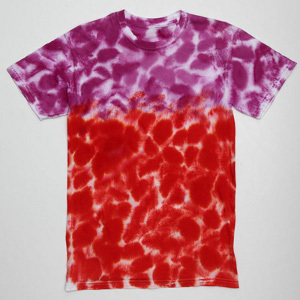 This Cobbled Bicolor Tie Dye Tee is a great project to start with. You can use opposing colors or similar colors to create a neat ombre effect. Wouldn’t this technique look adorable on a dress? Tie dye has come a long way since it gained popularity back in the 1960’s. Not only is it a fun way to add color and style to your wardrobe, but it’s a great way to get kids into the crafting. Tie dye also makes the perfect family activity, so gather up the kids and get ready for some post summer fun with these 18 Tie Dye Patterns from ilovetocreate.com and FaveCrafts! First, a confession: I’m obsessed with office supplies. Office Depot, OfficeMax, Staples—these are my toy stores. Therefore, when I first started seeing these spectacularly easy sharpie crafts, I just about died from the explosion of possibilities. I am a permanent fan. Get it? Apparently, when you write on ceramics with sharpies and bake them in the oven, the surface is safe for food! One of my favorite examples of the sharpie technique is this Wooly Willy Plate on AllFreeKidsCrafts. I’m also a big fan of these Rainbow Watercolor Boxes from FaveCrafts. 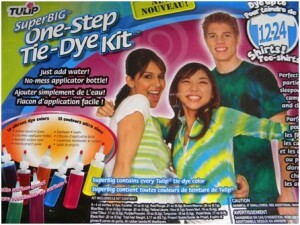 It’s also extraordinarily easy to tie-dye fabrics with sharpie! Even kids can get in on the action and make their own tie dye t-shirts will all sorts of psychedelic designs. In fact, wearables are some of the best sharpie crafts out there. From shirts to shoes to lovely necklaces, this roundup makes it easy to accessorize with simple materials and sharpies. Are you as Sharpie-crazed as I am? Have you ever washed a pair of pants or a white shirt and realized a little too late in the game that you had a pen or marker in one of the pockets in your clothes? If you’re one of the lucky few that hasn’t fallen victim to this, what results is a pile of tie dyed clothes that are, more often than not, completely ruined. However, when you use this technique to color fabric intentionally, the results can be magnificent. 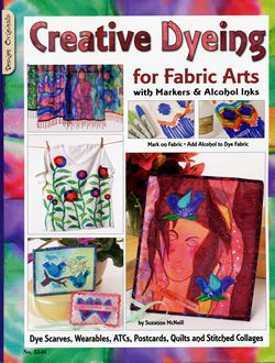 Author Suzanne McNeill has written a beautiful book titled, Creative Dyeing for Fabric Arts, where she teaches bold crafters how to use markers to color clothes, scarves, canvases, and more! And best of all, we’re giving away a copy for free! All you need to do is sign up to win! The projects in Creative Dyeing for Fabric Arts could be wearable art pieces. Silk scarves, beautiful jackets, and elegant wraps are given a new life with Copic markers…and with the skills you’ll learn in this book, you can have a unique, colorful, and stunning wearable accessory in no time. 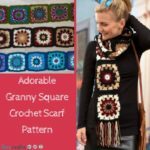 If you are interested in learning more about this awesome giveaway, check out the Creative Dyeing for Fabric Arts giveaway page and sign up to win! You have until May 15th to enter, and you can register to win once a day, so return often to improve your chances of winning this awesome book! Spring has sprung and the trees are starting to bloom and grow their leaves. I just love those trees with the white flowers on them, they are so gorgeous and smell amazing. All the bright colors including the sky and the sun just make me feel all warm and fuzzy. 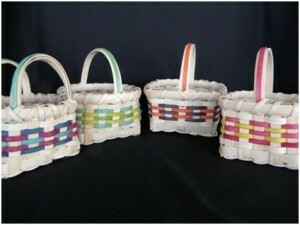 Now that the spring is here it means we can make spring crafts for the house. 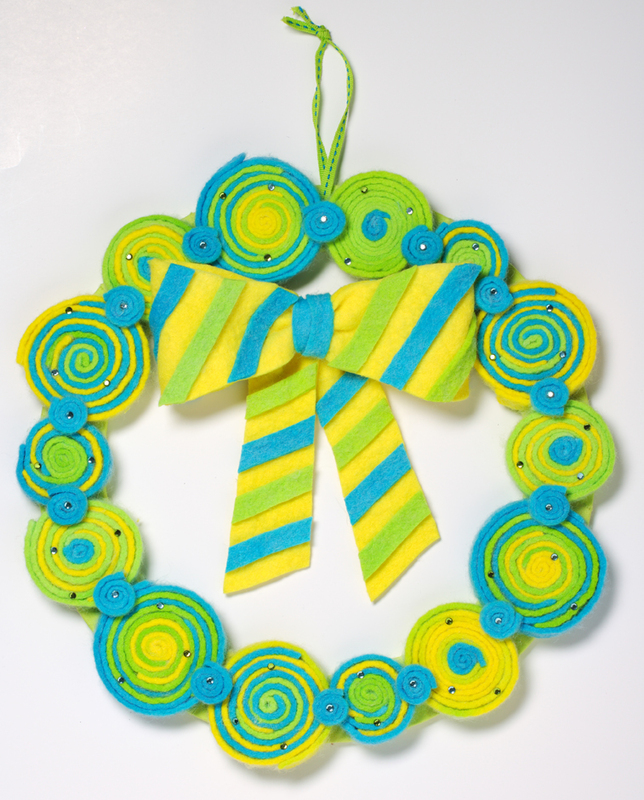 I came across this dyed felt spring wreath and just fell in love with it. Again, the bright colors caught my eye. It’s a funky wreath you can welcome your guests with. The kids can even help make it, you know they’ll enjoy themselves. 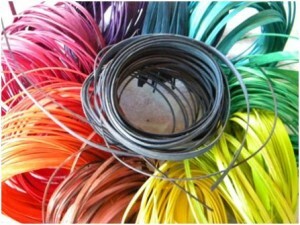 All you need to use is Tulip One-Step Fashion Dyes. 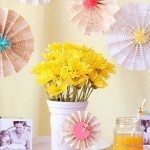 Another really cute spring craft for kids to do is the coffee filter flowers from FamilyCorner.com. Food coloring make these flowers fun to make just like tie-dye. Once the flowers are dry you can put them all around the house. 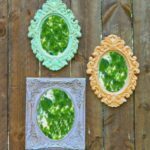 What are some fun spring kids crafts you can think of?